Ailanthus altissima is in the Quassia family. It is native to China. It grows in disturbed areas including riparian areas and may tolerate extremely harsh conditions. It forms dense thickets that outcompete native vegetation and reduce wildlife habitat. The female trees produce fruit at several years of age. One tree can produce 325,000 seeds or MORE annually! However, it does not produce a consistent seed bank. 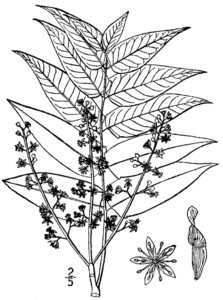 Tree-of-heaven also reproduces vegetatively from creeping roots. New shoots can sprout up to 50 ft. away from the parent tree. It is present in many places in San Luis Obispo County, especially riparian areas. It is difficult to control. Tarping seedlings may work. Small trees can be weed wrenched. The whole plant has to go: stump and roots. Ideally a chemical application on a cut stump should consist of 20% Garlon 4 Ultra with 80% crop oil.